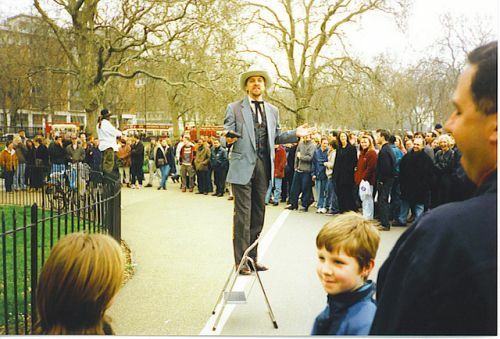 Speaker's Corner at Hyde Park is the only place in Britain where demonstrators can assemble without prior police permission, a perennial hot favorite location for preachers and speakers of all types wanting to be heard. Speaker's Corner at Hyde Park is the only place in Britain where demonstrators can assemble without prior police permission, a perennial hot favorite location for preachers and speakers of all types wanting to be heard. On Sunday mornings, orators turn up with a box or stepladder and harangue their audience on whatever it is they feel strongly about, be it the government, religion or war.